I am often asked how our off piste weekends work, or what makes them so special, or what a typical day is like. I am not expecting to answer all of those questions now, but having had a very good first day of this, our first off piste weekend of the winter, I am very enthused to write about it. The build up to this weekend has been quite stressful for me as 10 days ago there was precious little snow and although there was plenty of good piste skiing this was going to be scant conciliation to my team of powder hounds looking to explore the Klosters backcountry. Thankfully the snow arrived in the nick of time, much later than usual but in sufficient quantity to open up plenty of the off piste options. Then last night, the night everyone arrived, there was another dusting just to freshen everything up. We met this morning in Gotschna Sport, surely one of the best ski shops in the Alps for off piste kit, and once everyone was sorted out we headed to the Gotschna and up the mountain. We were a team of 10 - 7 guests, me and our two guides Snoopy and Georg. I have skied with both many times before so I know we were likely to have a great time. After a couple of warm up runs on the mahder, including a descent in some very nice soft snow, the group naturally sorted itself out into two, and I tagged myself onto one of them. 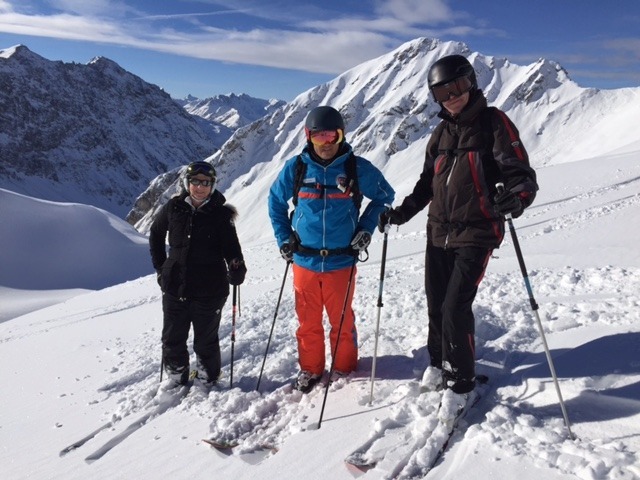 I love skiing with our off piste groups as I so enjoy seeing them explore everything that the mountains here have to offer. I also feel that many of our guests like having me as a back marker, especially if they have not done that much off piste skiing, as they never have to endure the pressure of being the last one down the slope with everyone watching and hoping they don't fall over and hold everyone up. They also feel that should they fall that there is someone behind them to pick up the pieces. Safe in that knowledge they rarely fall and so empowered end up skiing much better. We ended up as a band of four. The weather was glorious with hardly a cloud in the sky. We headed down Happy Valley in lovely snow and then through the meadows to Schifer, although lower down with the snow being not too deep we couldn't really let go for fear of hitting hidden rocks. Back at the top we bumped into the others (we were essentially following a very similar plan) and skied a lovely Hauptertali before doing a wonderful long descent over Alp Duranna to the Alte Schwendi for lunch. There the proprietress Josephine made sure we were well looked after and her home made ice tea proved particularly popular. Back at the top after lunch legs were beginning to feel a bit tired. I had our reps Anna and Alex meet us and we split into 3 groups - fast piste (with Anna), mellow piste (with Alex) and off piste (with Georg and Snoopy), so something for everyone! PT Ski flexibility to the fore! Everyone seemed thrilled with their first day and with heavy snow forecasted overnight and tomorrow it looks like there is plenty of powder to come. The plan for tomorrow? Let's see what the morning brings. Whatever it is, it is sure to be good.